Most, the eighth term which lasted long. It considers that it lasted until it becomes an old man if TOMIYAMA doesn't die. It appears for the wedding of the son of Takahashi of the lead guitar. A son's band and parent and child band confrontation.It was shameful because it went with the guest of honor. 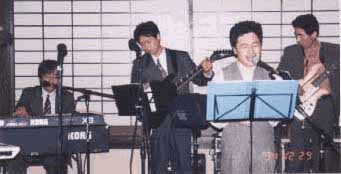 The singer of MOCHA BAND Mr. Sugiura. CD two sheets sale.